I am fascinated by history, especially when it involves places or events that I am connected to. This is the history of US Coast Guard radio station Guam. In the closing days of WWII, the US Coast Guard was busily installing and manning LORAN A stations around the world. In the Pacific, often before the smoke of battle dissipated, Navy and Coast Guard construction detachments quickly built LORAN stations to aide the war effort. After the war, some of these stations were moved or consolidated to better locations. More about LORAN history can be read at LORAN History web site. Along with the LORAN stations, which were often located on remote (read desolate) islands, a large support system evolved. This included Section offices, which oversaw about 8-10 individual LORAN stations, LORAN monitoring stations, Coast Guard air stations or air detachments, which flew in supplies and personnel, and communications facilities. LORAN A, the first version of LORAN worked on 1750 KHz, 1850 KHz, 1900 KHZ and 1950 KHz just above the AM broadcast band with moderate to low power levels. The signals were timed precisely with Caesium clocks and against each other. Charts were issued with with TD lines, which were basically timing lines based on the distance from a certain transmitter. A LORAN receiver on board ship or aircraft would receive two or more transmitting stations, then the navigator would be able to compare the TD lines on the LORAN chart to determine where they were located. This worked because radio waves travel at the speed of light, which is a constant. Since LORAN A worked on Medium Frequency (MF), the usable distances were not great, especially in the tropics, where MF does not carry far. Thus there were several LORAN A chains throughout the Western Pacific. There were also several Section offices, one in Japan (Far East Section or FESEC), one in the Philippines (Philippines Section or PHILSEC), and one on Guam (Marianas Section or MARSEC). Each of these section offices had a radio station attached, at FESEC it was NRT, at PHILSEC it was NRX and at MARSEC it was NRV. 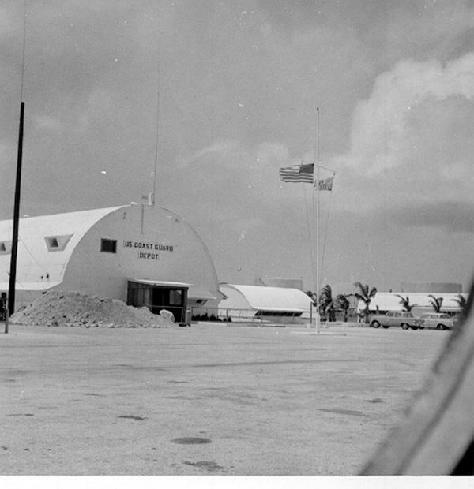 Coast Guard Guam Radio Station/NRV was an adjunct of the MARSEC command, occupying a small corner of an “Elephant” Quonset Hut on Cabras Island. The Elephant Quonset huts where the largest size half round corrugated steel structures that were quickly erected during the War. They had two floors and were not normally air conditioned, which is a significant detail on Guam. Several of these structures, located on various naval bases, survived numerous typhoons and the harsh tropical environment up until the year 2000 or so. In this picture, there are a couple of HF vertical whip antennas evident. These would have had antenna tuners and been used in the 5-25 MHz range. Most people think of the Pacific War and think of jungle and dense overgrowth. In the south pacific, that was often the case, however in the central pacific, often it was a dusty hot coral aggregate surface once the Seabees finished their work. NRV consisted of four radiomen standing six hour watches. Their duties included communicating with civilian ships entering the port of Guam and communicating with various Coast Guard units in the western pacific, including LORAN A stations on Ulithi, Yap, Saipan, Marcus Island, Iwo Jima, Angaur Island (Palau), as well as air guard for any air craft in flight and ship guard for any cutters underway in the MARSEC operational area. Almost all of the message traffic was sent by Morse code on High Frequency (HF). The radio room NRV occupied was noted to be about the same size as a radio room on a Medium Endurance cutter. This operational configuration continued until about 1966, when Cabras Island was transferred from the Navy to the newly established Government of Guam, for use as a commercial port. At that time, MARSEC moved to a new building next to Victor Warf, onboard Naval Station Apra Harbor and the Radio Station (RADSTA) Guam moved to Building 150, at the Navy Communication Station/NPN, Finegayan (Dededo). Building 150 was the primary operations center/receiver site for the Navy. It was located in the middle of a large antenna field, with long rhombic antennas pointed at various locations throughout the Pacific. This location was chosen by the Navy during WWII for its excellent ground conductivity. The closest geographical reference for building 150 is Pugua Point, located on a high plateau overlooking the Philippine Sea, to the west. Prior to WWII, this area was primarily ranches and farms because of its good soil, not found in many other places on Guam. RADSTA Guam was on the first floor, in an open room without partitions between operating positions. It was at this time that NRV took over primary responsibility for monitoring 500 KHz distress and calling frequency from NPN. LORAN A was being phased out for LORAN C, which required fewer transmitting sites. Facilities in the Philippines, Marianas and Japan LORAN A chains were combined into one Western Pacific LORAN C chain. The final LORAN A station was turned off in 1978. This reduced NRV’s workload considerably, as radio was replaced by landline circuits at all but the two most remote LORAN C stations; Iwo Jima/NRT3 and Marcus Island/NRV6. 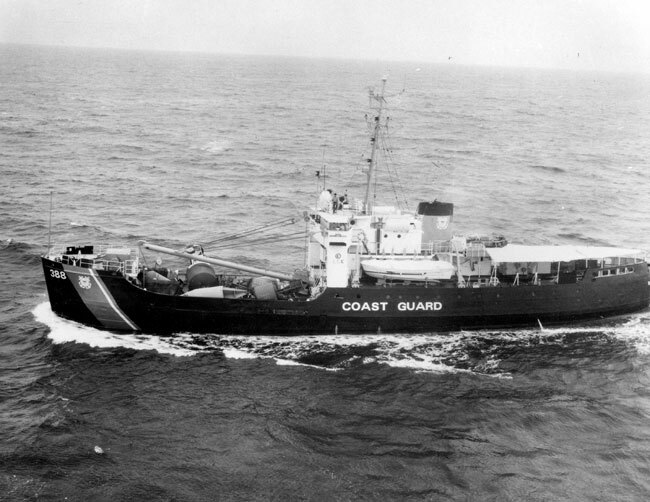 In addition to the LORAN stations, the CGC BASSWOOD/NODG (arrived 1968), CGC CAPE GEORGE/NRDT (arrived 1981) and CG Air Station/Air Detachment Guam (1950-1972) were all supported. The transmitters where remotely located at the Navy Radio Transmitter Facility (NRTF) Barrigada, approximately 12 miles to the southwest. Keying was sent via buried cable to building 112 where a microwave link completed the circuit to Barrigada. Transmitters were generally AN/FRT-70’s which were 1 Kilowatt HF units, however, other transmitters, power levels, and antennas were available on request. It was at this time, NRV began functioning more like a commercial coastal radio station, maintaining watch and answering calls on HF CW calling channels, relaying commercial messages to shipping interests on Guam and beyond. The Navy provided all supporting functions including dining, living quarters, medical, dental, etc. They also owned all of the equipment such as teletypes, some of the receivers, antennas, land line circuits, etc. In 1980, the designation was changed from “Radio Station” to “Communications Station.” NRV moved upstairs to the second floor of building 150. This was the final location and configuration for NRV. It was at this time the NRV took over keying the HF CW GCMP broadcasts from the Navy. The GCMP broadcasts were the last surviving Morse code fleet broadcast and used separate frequencies in the 8/12/16 and 22 MHz bands from NRV’s HF CW working position. SITOR service was also added about this time. During this period, there were four watch sections consisting of five to six watch standers each. The CO, XO and OPS boss were day workers as were new arrivals. Thus the total station compliment was about 28 people, all radiomen, accept the CO, who was a CWO2. NAVTEX service (ID V) was added in 1990 on 518 KHz. 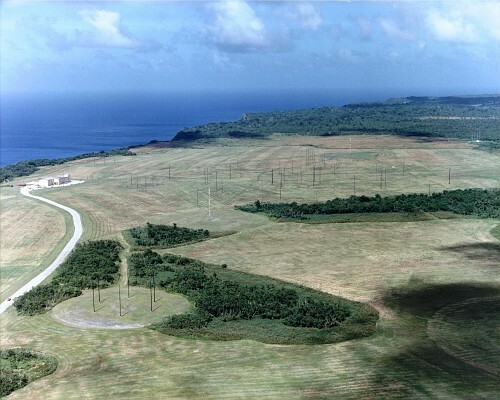 Communications Station Guam/NRV is located in building 150 onboard U.S. Naval Communications Area Master Station (NAVCAMS) Western Pacific. Communications Station Guam is the major relay station for all Coast Guard units located in the Western Pacific region. Communication Station Guam is a unique unit within the communications community. It serves the typical needs of it’s geographic area as would any COMMSTA, plus it also functions at various times as a MINI-COMMCEN, a SAR communications relay unit and a commercial coastal station. 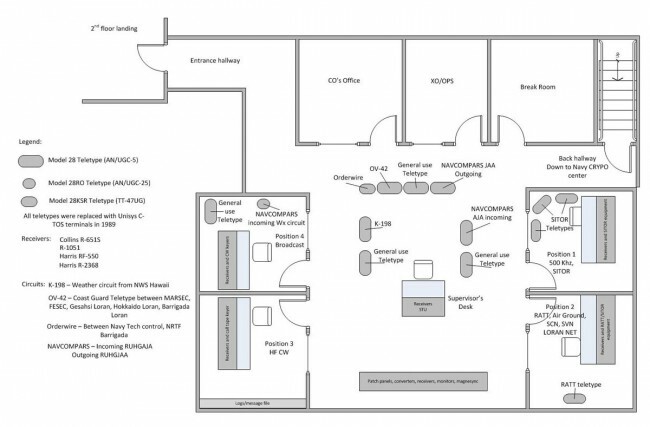 To get a better understanding of how COMMSTA Guam functions it is first helpful to get an idea of the physical layout of the station. After entering the station through a chipher-lock door, and passing through a short corridor, one enters the main communications area. Here are the majority of the teletype circuits and equipment, patch panels and the five operator positions, of which four are contained in separate cubicles (ed note: rooms) numbered 1 through 4 situated in a clockwise pattern. POSTION 2 is responsible for maintaining communications over several different circuits. Here, the operator monitors the Loran-C voice net and frequently utilizes it to coordinate communications primarily with LORSTAS Iwo Jima, Marcus Island, Gesashi, Hokkaido, Yap and FESEC in times of emergencies. A continuous listening watch is also maintained on the Coast Guard System Coordination Net (SCN). Although the primary purpose of the SCN is to coordinate communications between COMMSTA’s and Cutters, it is often used as a long range SAR contact frequency by merchant vessels, yachts on the high seas, and the like. When CGC Cape George, Basswood, or any other cutter operating in our area are underway, the position 2 operator maintains uncovered radioteletype communications with the vessels. Utilizing ARQ (Automatic Repeat Query) equipment, the operator is responsible of receipt and delivery of all record traffic for LORSTAS Marcus Island and Iwo Jima. Lastly, COMMSTA Guam maintains an aircraft Air-to-Ground circuit in position 2, when required. POSITION 3 is considered by our operators as the most challenging and rewarding position at COMMSTA Guam. The HF CW (AMVER) position. (AMVER stands for Automated Mutual Vessel Assistance Reporting) Here the operator must listen continuously to nine different channelized frequencies on six different receivers each with it’s own speaker. Through the “dits” and “dahs”, screechs, howls, and woodpecker sounds on the bands, the operator must try to detect and discern the often weak and barely perceptible signals from ships calling NRV. Often calls come from ships off the coast of South America to the Indian Ocean and even the North Atlantic. Only the most skilled CW operators man this position during peak traffic periods. High speed proficiency in CW is the number one goal of all operators at NRV. POSITION 5 brings together the combined efforts of the positions 1 through 4. The CWO, Landline Operator/Supervisor Position. Here, the processing of all incoming and outgoing messages over the NAVCOMPARS circuit, OV-42 circuit and the K-198 Weather circuit to Hawaii takes place. Although position five is manned by senior petty officers billeted for the station, a goal of junior operators is to qualify for certification at position five. The preceding description of the responsibilities of COMMSTA Guam is by no means complete. Flexibility is the key to successful and timely fulfillment of our mission which constantly changes in its scope and magnitude. The positions where the watches were stood were relatively small rooms. The normal position rotation schedule was 4 hours in each of the positions one, two and three. This worked to keep the watch operators fresh, as each position had a different skill set. Position 4 was stood by the same person for the entire 12 hour watch, this was to keep the broadcasts consistent. It was also the least challenging position unless there were multiple typhoons active in the western pacific. The watch supervisor was usually a senior RM2 or RM1 and the chief watch officer was a senior RM1 or RMC. The Position 5 nomenclature sort of dropped out of usage when I was there, it was generally called the “supervisor or CWO” position. Watches were 12 hours on/12 hours off for three days. After a day watch rotation (three days of working from 6:30am to 6:30pm), there were two and a half days off then the night rotation started, which was another 12 on/12 off period for three nights (6:30pm to 6:30 am). This was followed by four days off. By 1993, the western pacific LORAN chain was either turned over to the Government of Japan or decommissioned. The 500 KHz watch, HF CW service and GCMP broadcasts were all discontinued. Other functions, such as SCN (Ship Coordination Network), HF voice and SITOR services were remoted to COMMSTA Honolulu, HI/NMO. This effectively closed the station down. By late 1992, all personnel were transferred to other commands. In 1997 NMO’s operations were in turn remoted to CAMSPAC/NMC. VHF channel 16 and 2182 KHz are monitored by Sector Guam (the former MARSEC). In 2008, NRV stopped accepting OBS and AMVER reports via SITOR. The HF voice and SITOR weather and NTM broadcasts continue as of 2011, keyed from CAMSPAC/NMC. For general operating conditions in the late 1980’s and early 1990’s, read my recollections on working there.